I woke up this morning to the most beautiful day. Sweet Oklahoma always seems to deliver this kind of gentle apology for the weather’s bad behavior the morning after a slew of damaging winds, lightening, and thunderstorms. 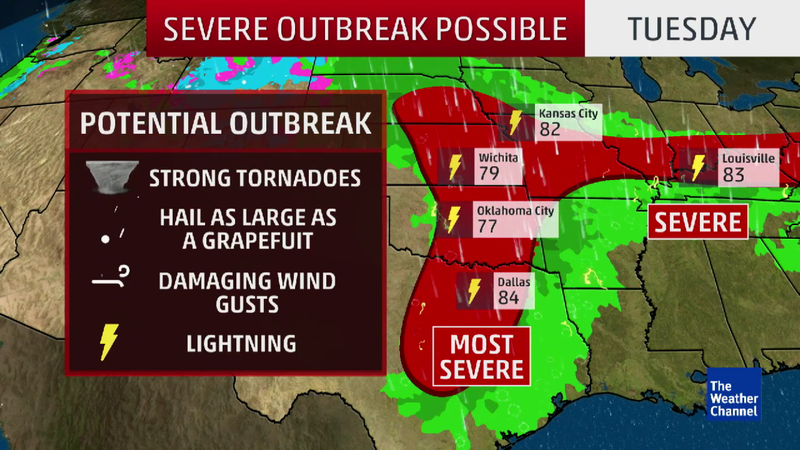 Much of the heartland was under severe storm, tornado, and hail warnings last night. Sean and I were just fine, but my heart goes out to those who are recovering with damaged homes and businesses! Even if you’re stalking the weather report’s radar minute by minute, it’s still hard to truly predict what’s about to happen to you, your loved ones, and your home during tornado or hurricane season. When the sky is dark, the air is erie, and the increasing wind gusts bring your heart rate along for the ride, fear can certainly settle in. You want to protect everything you love as you fear that the worst will happen, but all you can do is just take shelter, wait, maybe have a cocktail for moral support if you can, and have faith that it will all get better soon. Then, along comes a new day :). I stepped outside this morning to soak up the brilliant sunlight on my pale face, breathe in the sweet morning air, adore the white puffy clouds, and feel the gentle breeze. It was awesome. Okies – did you soak it in?! I hope so! What a healthy vision to start the day with a clear and positive mindset. The night before’s stark contrast to the blissful feeling from this morning reminded me of the struggles that we all go through which are always, without fail, greeted with a new day. I’ve had lots of people on my heart lately. So many are going through their own relative “storm” of sorts whether it’s health struggles, work demands, long term dreams that may feel unreachable, or simply trying finding balance amidst total chaos each day. We’ve all got something, am I right? Riding out the day in the heart of those “storms” is disheartening and seemingly endless in the moment, but the perspective we choose to break through each day with is nothing short of powerful. Another practice is where I occasionally add to a list that I started a long time ago of all-things-happy. I wrote an article about it for Oklahoma Women Bloggers last Spring, actually! You can read it here: OK Women Bloggers – “Don’t Miss It” . Will you do me a favor? Because I LOVE hearing from you? Comment in today’s post with your own favorite things. At least 3 of them. If you’re too shy…at least write them down somewhere for yourself or start your own list that never ends. It’s seriously the sweetest list to return to every few months. Ohhhh I just had to do it. Adding that clip was pestering me this entire blog post! You’re welcome ;). My three favorite things today…1. morning hugs from my little boys. I seriously can’t enough of them. 2. rain. I know that soon the earth will be baking in the summer heat. I love hearing the birds sing their delight and the earth soaking up the moisture. 3. coffee. Need I say more?